This page has information on the department's central orientation program and local induction for remote teachers. If you are a graduate teacher, new to the Northern Territory or a recommencing teacher (returning after 3 years or more), you will be involved in a central orientation program to help you transition into your position. The program provides you with an opportunity for professional networking and to learn more about living and working in remote Northern Territory communities. You will also learn more about the department’s resources, support services and strategic initiatives. You will discuss best practice strategies and pedagogy for teaching Aboriginal students as well as curriculum, assessment and reporting expectations. You will be further supported through a local induction when you arrive in the community. Your local induction will begin with an introduction to the community, to local people, places, expectations and practices. You will also be introduced to school priorities, policies, procedures, processes and routines. 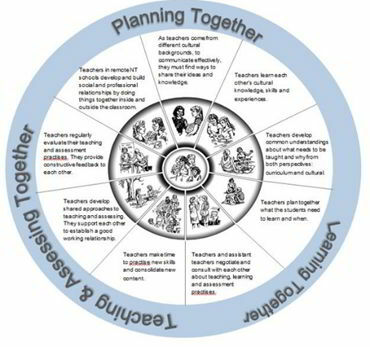 This is a perfect time to meet the teaching team to discuss ways you can learn, plan, teach and assess together. Talking with local Aboriginal teachers, assistant teachers and community members will help you learn about students, the community and culture. Your induction will continue and be supported through mentoring and professional learning. The duration of local induction will depend on your career stage and needs. To learn more about local induction read the information for principals section. identify opportunities to help maintain your wellbeing and build your professional identity. Department of Education Work Health and Safety staff site. Some of the links and documents are on the department's intranet site. You will need an NTSchools account to access the intranet. Read more about registering for an NTSchools account. Go to the Teacher Registration Board of the Northern Territory website for information on professional standards and ethics.